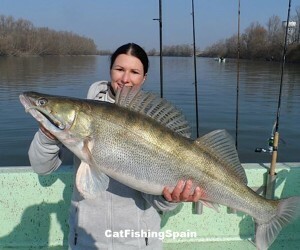 Book your holidays trip for zander fishing at Mequinenza on The River Ebro, in Spain. 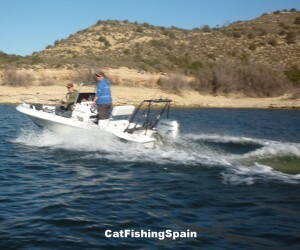 We now offer trolling for Zander or drift fishing, taking you out for the day, providing you all rods and lures. You can bring some of yours to try if you wish. This is one of the best and most relaxing style of fishing around. 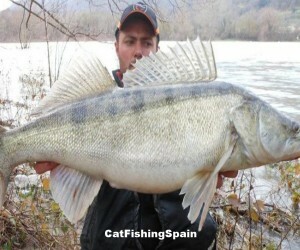 Live the adventure of fishing zander in Spain!! 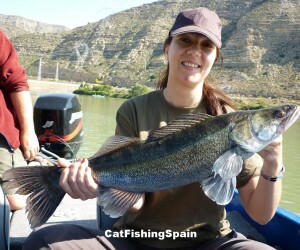 The best time for Zander fishing is September, October and November and then February, March, April or May. 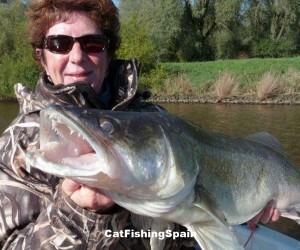 The cooler months from November to March are the perfect times to be more fruitful in catching the zander fish. 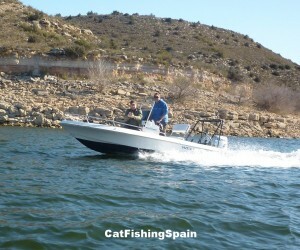 Fourteen years of experience fishing the waters of the Ebro, has taught us to know every corner of the reservoir and depending on what type of fish you seek and the time of year you join us, we will know where to fish. 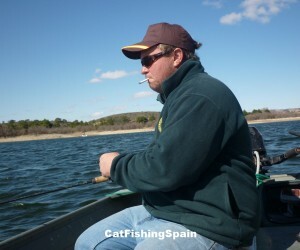 Zander fishing is less strenuous than catfishing, because zanders are in deeper waters, are much slower and more technique is involved. 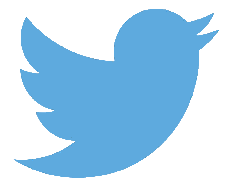 The search has to be more subtle, with a greater degree of concentration, seeking the slightest sign of them before they detect and reject you. 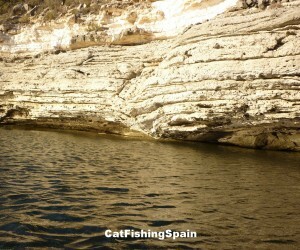 Due to various factors, there is no fixed fishing area and fishing spots vary depending on the level of the reservoir and the colour of the water. 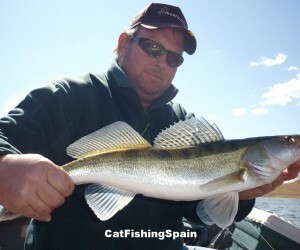 This is especially so, during the autumn and winter months at the Mequinensa Reservoir, whether it has remained high, as the zander seek it at its highest, having spent many years in the Chiprana Escatron. 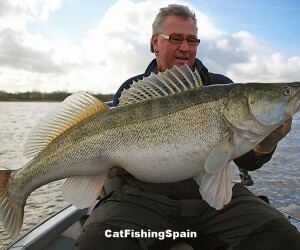 Then we need to find an area which has a large population of good size zander, since most adults are seeking this reservoir area to spawn. 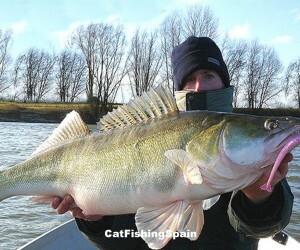 Due to the size and proximity of spawning and its location in the months of February, March, April and May, it is possible to combine fishing for zander with catfish, although this depends on the reservoir level and colour flow. 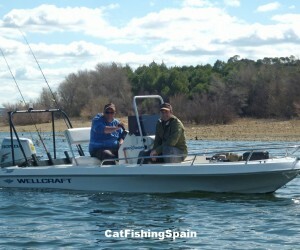 When the river Ebro floods and its colour is "chocolate", in the area of Escatron Chiprana, we can forget about walleye, but it is more fruitful for fishing catfish. 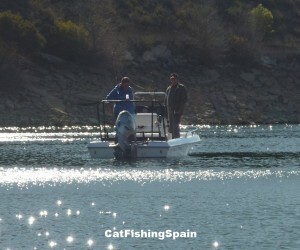 If during the autumn and winter, the reservoir has remained low, this area will rise Chiprana Escatron and so the fishing will be very different and many miles downstream, (Caspe), having dates and days when it is possible to capture many specimens of all sizes. 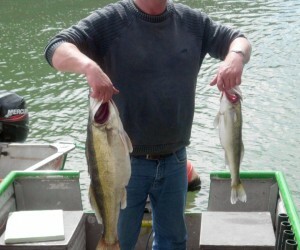 This is why guides and fishermen who do well, are those who adapt to fishing conditions and not vice versa. 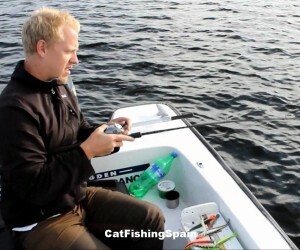 Although fishing is never an exact science, otherwise it wouldn't be fishing, it is very important to know what to do and where it is convenient to fish at all times. 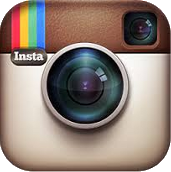 Any information you request from us, is under no obligation and we always adapt to your situation, suggesting what is the best choice for you and your group.